People say its a life-changing experience. And theres no doubt that when you make the incredible journey to India and Nepal, youll return with a new outlook on life and endless extraordinary memories. Fascinating and intriguing, this is a world thats far removed from our western way of living. Our wonderfully designed tour encompasses the very best that Northern India has to offer. From fascinating Delhi and the Taj Mahal to Varanasi, one of the oldest cities in the world, youll visit holy temples and mosques, exquisite palaces, the mighty fortresses of the Moghul Empire and many powerful reminders of the past glories of the Raj. Nothing quite prepares you for the breathtaking beauty and majesty, the purity of the white marble, its exquisite ornamentation, precious gemstones or constantly shifting colours of the Taj Mahal. Created by thousands of craftsmen for Emperor Shah Jahan, in his wifes memory, with whom he fell in love at first sight, it is one of the wonders of the world and still stands today as a symbol of eternal love. Nearby is the 11th century Agra Fort  a UNESCO World Heritage site, fought over, destroyed and rebuilt over the centuries to become a walled city housing palaces, pavilions, mosques, gardens and priceless treasure, as befits the seat of the vast Moghul Empire. City of temples, palaces and ghats descending to holy waters, Varanasi has been a cultural and religious centre for thousands of years. Legend has it that the city was founded by the Hindu deity Lord Shiva 5,000 years ago, growing famous for its fine muslin and silks, perfumes, ivory works and sculpture. Certainly 3,000 years old, its one of the oldest inhabited cities in the world and probably the oldest in India. One of the seven sacred cities of the Hindus, Buddhism was founded nearby. Youll see for yourself the towering Dhamekh Stupa where Buddha is said to have revealed his Eightfold Path to nirvana. Then its off to Nepal, a complete contrast and rich in some of the worlds most astonishing natural beauty. Youll take a once-in-a-lifetime flight to the Himalayas, seeing the staggering white peaks of Mount Everest, visit the captivating medieval city of Kathmandu, seek out rhinos, bears and tigers on a safari through the jungle, and share the peace and tranquillity of Buddhist monks at prayer. 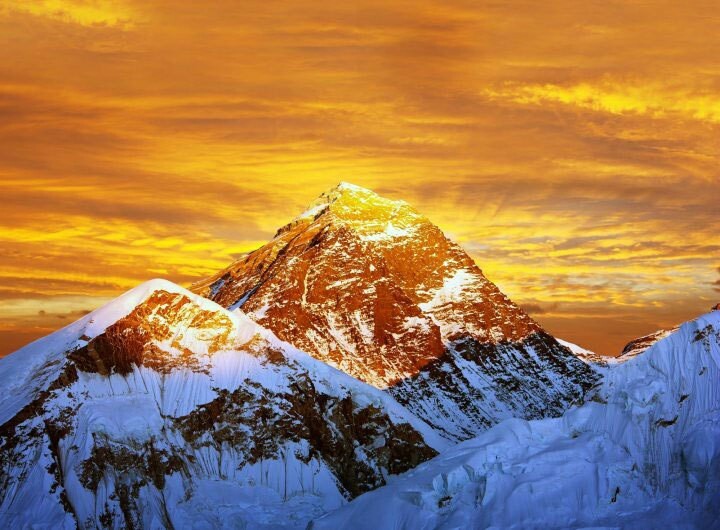 Can you picture yourself on the summit of Mount Everest? Probably not! But few people will ever get as close as you will when you take a flight on our private plane, soaring high above the clouds to the vast scale of the immense Himalayas. Its incredible to think here you are at the highest point on the planet, something you probably have never contemplated you could ever experience. You can take photographs of this amazing panoramic view from the cockpit. Chitwan National Park brings you close to one of the worlds finest natural wonders. Hills, raging rivers, flood plains, tropical forests, grassland and lush vegetation, the park is home to migratory birds, rhinos, leopards, elephants, bears and of course the elusive and endangered Bengal tiger. Seeing this wonderful wildlife in these natural surrounding is an unforgettable experience. Youll be amazed and rewarded every day by the most dazzling and colourful array of unexpected sights, heady aromas, and a true culture shock of astonishing contrasts. Arriving late morning you stay one night at the five-star Leela Ambience hotel, with all the excellent facilities you expect from an international hotel. After a rest you begin a guided tour of New Delhi, a beautiful city that clearly reflects the legacy of the British Raj. Surprisingly green, it is divided by wide tree-lined avenues with the Presidential Palace (formerly the Viceroys residence) at its centre. You see the imposing Rajpath, India Gate and the Parliament building and visit the 12th century Qutub Minaret  the tallest stone-built tower in India  and Humayuns tomb, upon which the Taj Mahal is modelled. A guided tour of Old Delhi takes you first to the memorial of the great Mahatma Gandhi, the Raj Ghat. Then theres the Red Fort, one of the worlds great fortifications with huge walls nearly two miles long. Next its one of Asias largest mosques, the Jama Masjid. Holding 25,000 worshippers, it displays wonderfully intricate decoration and marble work. In the afternoon we take a fascinating drive to Agra to stay two nights at the four-star Courtyard by Marriott hotel. We rise early to catch the sun rising over the Taj Mahal  undisputedly one of the worlds most beautiful buildings. In the soft morning light, as the mist rises from the Yamuna River, it seems to float like a mirage above the surrounding landscape. Built from dazzling marble, its colour changes from white to yellow, cream and almost to orange¦ an exquisite image that youll remember forever. Next you visit the immense Agra Fort. Completed in 1573 from red sandstone, dominating the surrounding area, this was the magnificent seat of the vast Moghul Empire. This evening you can visit the Taj Mahal at sunset as an option. Bathed in light of a different colour, the varying shadows afford another view of this astonishing, world-renowned and enthralling icon. Leaving Agra by train in comfortable air-conditioned chair-class to Jhansi, one of the centres of the Indian Mutiny, we continue by coach to nearby Orchha. Surrounded by jungles, this remarkable medieval town is an architectural gem. Discover the 14 chhatris  or cenotaphs  built as memorials to its Bundela rulers. Soak up the magical atmosphere as parrots and vultures circle these mystical buildings, with fabulous views to the river. Marvel at the palaces of the Orchha Fort complex, admire the fine architecture and step inside to see the bold, colourful religious murals. After lunch at the splendid Amar Mahal Palace or Orchha Resort we drive to the small town of Khajuraho for bed and breakfast at the four-star Hotel Taj Chandela. Today we visit some of Khajurahos remarkable temples, a UNESCO World Heritage Site and one of the seven wonders of India. Originally 85 temples were built between the 10-12th centuries and today, 22 of these mystical shrines survive. Their colours change with the intensity of the sun and the carved figures illustrate sensuous poses of such high relief that you can distinguish jewellery and manicured nails. You then take the 45 minute flight to Varanasi. Founded in the 6th century BC, and one of the oldest cities in the world, Hindus believe it to be the centre of their universe. Nestling on the holy River Ganges, Varanasis old city is a labyrinth of tangled alleys, shops and workshops, through which we take an exciting rickshaw to the river. Buzzing with pilgrims, the banks are lined by high, centuries-old palaces, with descending steps or ghats down to the waters. Here the faithful wash themselves in the holy waters while brightly clad Brahmin priests practise yoga and meditation. Boarding a small boat you explore this incredible waterfront. We witness the Aarti, one of the most impressive Hindu ceremonies, as large crowds chant and pray, setting small candles adrift on the water in memory of loved ones. You will also probably see several of Varanasis famous funeral pyres, where mourners gather and the whole riverbank glows with a flickering yellow as the deceased receives instant enlightenment. We stay for one night, with breakfast at the four-star Taj Gateway hotel. The soft morning sun illuminates the river through the mist. After a morning boat ride, you walk through Varanasis narrow lanes and enchanting array of shops selling carpets, intricate polished brassware and fine silks. We drive to nearby Sarnath, where 2,500 years ago, after gaining enlightenment himself, the Lord Buddha gave his first sermon, founding one of the most enduring of world religions. We visit the 1,700-year-old Dhamekh Stupa, towering 31m high and said to mark the spot where Buddha revealed his Eightfold Path leading to nirvana – and see a green marble coffin allegedly containing his relics. This afternoon we fly to Delhi and spend the night at the five-star Andaz Aerocity Hotel. This morning we fly to Kathmandu, capital of Nepal, one of the worlds most naturally beautiful countries. Set in a bowl-shaped Himalayan valley 4,500 feet above sea level, this captivating city and Nepals cultural heart is surrounded by breathtaking snow-capped mountains. The contrast with India is striking, with Buddhist temples reminiscent of the Far East much in evidence. We visit the famous 14th century Boudhanath Stupa, Tibetan in origin and one of the holiest of Buddhist sites. The gentle sound of chanting and praying fills the air, while traders sell lamps, cloth and all sorts of fascinating goods in an enchanting kaleidoscope of colour and noise. We stay two nights with breakfast at the sumptuous five-star Hyatt Regency hotel. Today you experience something most people never will, a flight to the Himalayas to see majestic Mount Everest. Twice the size of the Alps, their sheer immensity is mind-blowing. Carrying just 16 passengers, our aircraft flies over peaks and clouds bathed in an early morning golden glow. The 45-minute flight offers an incredible panorama and you can take a photograph of the worlds highest mountain from the cockpit. If conditions are unsuitable we have two more opportunities during the holiday. This afternoon you explore the fascinating sights of Kathmandu and visit Patan Durbar Square, one of the most glorious examples of traditional Nepalese architecture, full of centuries old temples and palaces. You take the scenic drive to Chitwan National Park, Nepals most famous wildlife reserve and one of the finest in Asia. Overlooking the lush forested valley and the Rapti River, the Narayani Safari Lodge, where we stay for two nights with full-board is clean and comfortable but simple, without telephones or televisions  a real opportunity to experience and savour the peaceful surroundings. We visit a local village by ox cart to learn how local people live in a sustainable manner in harmony with their spectacularly beautiful surroundings. After dinner, a slide show brings the huge variety of flora and fauna of the reserve to life. Viewing wildlife in its natural habitat is often a life-changing experience. Rising early, as the sun breaks and accompanied by a unique dawn chorus, we cross into the reserve for a safari. Your naturalist guide is there to help you spot rhino, wild boar and if youre very lucky, sloth bears. We return to the hotel for breakfast, after which there will be an opportunity to watch the elephants bathing in the river. After lunch, we have the option of a trip by dugout canoe to a crocodile farm, returning on foot along the riverbank. We drive north towards the small town of Pokhara in central Nepal. Inhale the clean air, taking time to fully comprehend the staggering beauty of an area surrounded by some of the worlds highest mountains. This afternoon, we take a boat ride across Lake Phewa for unbeatable views of the Annapurna mountain range. Watch reflections of their dazzling white peaks sparkle in the mirror-like water, and listen to the soothing sound of silence. This is probably one of the finest mountain panoramas in the world. We stay for two nights at the four-star Pokhara Grande Hotel with breakfast. Wake up early today and catch the sun rise over the Annapurna range, a truly magical experience. Watch the mountain peaks turn from soft pink to shimmering gold as the sun climbs higher in the clear blue sky. There are twelve peaks in the world higher than 25,000 feet, eight of them are in Nepal and from this spot on clear days you can see three of them. Truly staggering! In the afternoon, we fly back to Kathmandu for our final night at the five-star Hyatt Regency hotel.